The 26th Nishagandhi Dance Festival at Thiruvananthapuram (20-27 January 2017) was flagged off by the Governor H.E Justice (Retired) P. Sathasivam, by lighting the lamps held by some ten dancers in a semi circle and more than 30 dancers providing backdrop and few standing on either side, choreographed by senior Guru Girija Chandran, conceived and directed by Mathew Itty. The dignitaries including the Minister for Tourism, MLA, Mayor, Director, Department of Tourism, dancer Bharati Sivaji, followed the Governor when he went on lighting the lamps. Music was played to which the dancers demonstrated the hastas. Colourful and spectacular, it was an impressive ceremony. The Nishagandhi Puraskar for 2017 was given to Mohiniattam dancer Bharati Shivaji from Delhi. From this year it was decided to have a separate exclusive dance festival and one more category of Contemporary dance was also introduced. The Governor suggested that Kerala Tourism Department could arrange a separate Music Festival. The opening dance Prakriti-Purush was group Odissi by Orissa Dance Academy, Bhubaneswar, choreographed by Aruna Mohanty, a disciple of late Guru Gangadhar Pradhan. It reflected the philosophical concept Prakriti as Shakti, the embodiment of energy and dynamism and force behind all action and existence in the material universe and Purush as embodiment of bliss, symbolizing abstraction, beyond confinement of shape, words and knowledge. 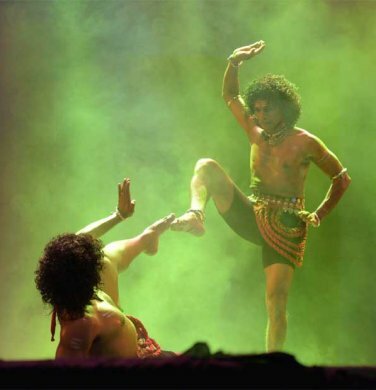 The male dancers performing vigorously, joined by the female dancers to the music by Bijaya Kumar Jena and rhythm composition by Bijaya Kumar Barik, the group dance created visuals of beauty with graceful movements. The male dancers Pravat Swain, Rodra Prasad Swain and Pratap Barik performed in sync with female dancers Madhusmita Mohanty, Sridutta Bhol and Jahnabi Behera. Their excellent training lent a unity to the form highlighting the overall design. Hamsadhwani Pallavi originally choreographed by Kelucharan Mohapatra was reconstructed as group choreography for two male dancers Rudra Prasad and Pratap, by Aruna exploring the space and form in a delectable manner. The music by Bhubaneswar Mishra is evergreen and these are gems of choreographic creations by Guru Kelucharan Mohapatra and Bhubaneswar Mishra. Both the dancers executed movements to the enchanting and melodious music creating exquisite harmony. In Gita Govinda ashtapadi "Yahi Madhava, yahi Keshava" depicting khandita nayika, Madhusmita Mohanty as Radha along with her sakhis enacted by Sridutta Bhol and Jahnabi Behra, refuses to accept Krishna's pleas for not keeping his word, arriving with sleep eyes, tell tale marks of having dallied with other gopis and inventing lies when accused by Radha. Aruna as Krishna portrayed the shath, clever and dhurta, lying nayaka in a commendable manner. In her anger, Radha seemed to be over reacting pushing Krishna physically. It looked rather lokadharmi. As an uttama nayika it did not look an appropriate behaviour on her part. To the music by Subas Pani and choreography by Guru Gangadhar Pradhan, assisted by Aruna, the ashtapdi "Chandana charchita" was performed by all dancers together. It depicted gopis dallying with Krishna. The pranks of Krishna and gopis, some gopis pretending to tell Krishna sweet nothings and kissing his ear lobes, some gopis meditating on Krishna's charm, some ringing the bangles through claps to the tunes of Krishna's sweet flute, creating a festive mood dancing and prancing, and sakhi telling Radha to see the joyous dance. The choreography exuded the joy, group dance in bowers of Brindavan, Pravat Swain as Krishna flirting with gopis, and dancing in several enchanting patterns. Set to Mishra Khamaj raga and ekatali the group dance had all the charm of the Sanskrit poetry of Jayadeva. Aruna as a performer and a choreographer succeeds in creating group dancing investing the Odissi form with beauty. The uniformity of movements stands out as well as the variegated patterns. The team of accompanying musicians Guru Bijaya Kumar Barik (mardala), Haripriya Swain and Pradeep Kumar Das (vocals), Ramesh Chandra Das (violin) and Soumya Ranjan Joshi (flute) gave customary support enhancing the dance. Lighting by that multitalented dancer Ramesh Chandra Jena was evocative. In order to promote talented young dancers the organizers presented Sanjana Arun, a disciple of V. Mydhili, in Bharatanatyam. 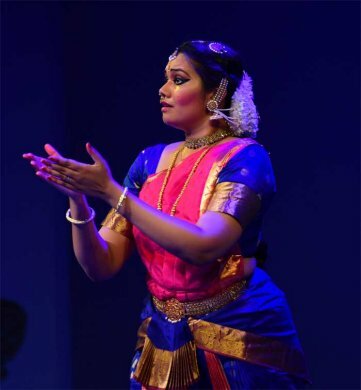 She performs as a lead dancer in Soorya Cultural Society's Rhythm production. In her brief recital she presented the song of Swati Tirunal in Bhairavi in praise of Lord Shiva, usually sung on 5th day of Navaratri. It elaborated upon various attributes of the lord and she struck poses with confidence. The highlight of the second day of the festival was Mohiniattam by Dr. Neena Prasad, disciple of Kalamandalam Sugandhi and Kshemavathy. Besides Cholkettu and Sivapanchakshari, she warmed up in Swati's song in praise of Devi Anandavalli. The anecdote she depicted was quite interesting. The devotee while mentioning about waning of the moon by mistake mentioned pournami and the King was taken aback and challenged the devotee that if it was not pournami he will be punished. The devotee resorted to the goddess who flung her nose ring in the sky and its brilliance looked like pournami, the effulgence full moon light. But when Neena presented the theme of sakhyam, as a part of Navavidha Bhakti, friendship between lord Krishna and Arjuna, in abhinaya Neena scaled greater heights. The story based upon Mahabharata episodes scripted by M.J. Sreechithran to the music by Changanassery Madhavan in nutshell dwells on attaining salivation, bonding for strength and self realization. When Krishna renounces the world, Arjuna feels helpless, cannot protect people from Dwaraka, recalls when a Brahmin had approached him after his nine children were dead and the tenth was to be born, Arjuna had promised to protect, and if he could not then he would immolate himself in fire. Lord Krishna stopped Arjuna from immolating and led him to Vaikunth, sent sudarshana chakra to light up the path; in Kurukshetra, Krishna encouraged him to fight with his kith and kin, and told him to do what was necessary. Krishna tells him to shake off shield of darkness and emerge with a new radiance and proceed for Mahaprasthan. Arjuna feels presence of Krishna alongside him walking together in unison to eternity. The seamless abhinaya switching from Krishna's to Arjuna, face wearing helplessness, and seeking strength from friend Krishna were expressed with great artistry. Neena had explained the story in detail in Malayalam to the large audience who applauded her artistry. Krishna's advising Arjuna nanu shochanti panditaha- the wise do not look back and so on were enacted with dignity. Neena received a standing ovation. From Chennai, Srimayi Vempati (disciple and daughter-in law of Vempati Chinna Satyam) along with her 11 year old daughter Kameshwari presented in Kuchipudi, Suryastuti Japakusumasankasham describing the glory of Sun God in typical Vempati bani. The thorough training Srimayi has received under Vempati was evident. The lilting quality, the bobbing up, up and down movements, the quicksilver gait et al was well projected. Kameshwari Lakshmi is a chip off the old block. Dance is in her blood and even at this young age she executes movements with agility and grace. Her Shivashtakam in Mohanam, khanda chapu was performed with zest, except that in looks she appeared a slip of a girl, but made up with her enthusiasm and passion. Srimayi in elaborate Kshirasagara shyanam in Devagandhari raga and adi tala projected feeling of devotion for Lord Rama appropriately. The number choreographed by Vempati offers scope for abhinaya. Srimayi and Kameshwari Lakshmi concluded with Marakatamanimaya chela tarangam. It had so happened that the dancers had arrived just in time for the performance as their train was late by 10 hours and the tension was felt when they concluded the tarangam. Whereas Kameshwari Lakshmi went through her paces well, Srimayi appeared tense. Under such circumstances, it would be advisable to conclude program with a choreographic work which is less strenuous. However, this can happen to any artist. It is no reflection on their art. From Guwahati, Assam Guru Jatin Goswami's disciple Lima Das presented three episodes based upon Bhagavata Purana, Assamese Mahabharata by Ram Saraswati, specially choreographed by Guru Jatin Goswami. Earlier she presented prayer based upon Sankaradeva's Kirtan Ghosha, Madhava Deva's Naam Ghosha. Lima has an attractive stage presence and succeeds in characterising the mythological characters with dignity, registering various bhavas in a delectable manner. In Krishna - Kubja samvad, the entrance of Krishna in Mathura, the beauty of the garden, and description of encounter between lord Krishna and Kubja with musicians providing vachikabhinaya highlighted the dramatic impact. Applying chandan paste to Krishna, Krishna lifting face of hunchback Kubja and her transformation into a beautiful maiden were achieved in a seamless manner. Kubja's wonderment at looking at the lord, 'mahavismaya, tumi ishtadeva' prayer and her salutations to lord Krishna ended on a pleasant note. In Draupadi vastraapaharana event from Mahabharata, the rendering of the text for Draupadi's prayer to her five warrior husbands, in full view of court with Bhishma, Dronacharya, was heart rending. Addressing Krishna as Kripasindhu, Anathajanabandhu, Vipadbhanjan, Lima projected complete helpless state. Krishna protects her and Dushasana drops on the floor exhausted. With a bhramri, turning round, Lima enacted different characters evoking sadness. The communicative power of the story is so strong that even though Sattriya dances are not seen in Thiruvananthapuram, the dance form spoke volumes to the audience. The third episode of Ekalavya, a low caste forester wanting to learn archery from Dronacharya, preparing Dronacharya's statue and mastering the art was performed with intensity. The way of shooting arrows at a barking dog and fixing arrows around his mouth without hurting the dog amazes even Dronacharya. But to keep Arjuna as supreme archer, he demands guru dakshina and Ekalvya offers the thumb without hesitation. The twist in the end showing Ekalavya shooting arrow managing without the thumb, was to prove supreme will power of Ekalavya. Lima succeeded in distinct depiction and characterisation of these three mythological characters. The musicians Dhrubjyoti Barua (vocal), Kushamahanta (khol), Prasanna Barua (flute), Dwipanvita Sarma (violin) and Anupjyoti Bhuyan (cymbals) provided traditional music highlighting the dramatic aspects of presentation. Kathak by Ahmedabad based Maulik Shah and Ishira Parikh, disciples of Kumudini Lakhia regaled the audience with their spirited execution of Jayat tala of 13 beats with footwork, recitation of the mnemonics and interweaving with infra forms of parans, parmelu, bringing down the house displaying their command over tala and laya. Their entire group had begun with Ganapati stuti. Kathak as a dance form has instant appeal to the masses if the dancers succeed in getting them galvanized to the intricacies of tala and laya. That Maulik and Ishira managed to do so artistically. Titled Vividha, the couple had choreographed an interesting number in which female dancers while circling brought lamps and evoked the mood of a court with a Sufi song: Ho gayi diwani, tori surat dekhi (turned mad seeing your face), tose nayana lage (the eyes met with yours). The dancers in white costumes with lamps created a nice ambience. Maulik in bhajan by Meera wove sancharis of well known episodes, familiar to audience. The game of dice, humiliation of Draupadi, final defeat of Dushasana, Hiranyakashipu's challenging son Prahlada and being killed by Lord Narasimha were enacted in a solo with dramatic intensity. Maulik impersonated various characters in a telling manner. Tarana as a group performance set to Puriya Dhanashree (music by Niraj Parikh), and finale Utsav with entire Anart Foundation dance company performing together throwing flower petals joyously on audience, won them rounds of applause. It indeed turned out to be like a celebration and it was obvious that their presentation of Kathak was a resounding success. The group consisted of well trained dancers including Kadam Parikh, Namrata Shah, Jigna Dixit, Raina Parikh, Anjani Parikh and Naisargi Gor. From among the musicians Joby Roy, (he is from Kerala, settled in Ahmedabad)) won applause for his accompaniment on tabla, whereas Prahar Vora (harmonium and vocal), Hriday Desai (sarod), Shreyas Dave (flute) and music compositions by Niraj Parikh and Shweta Jhaveri was commensurate with the company's high standard. 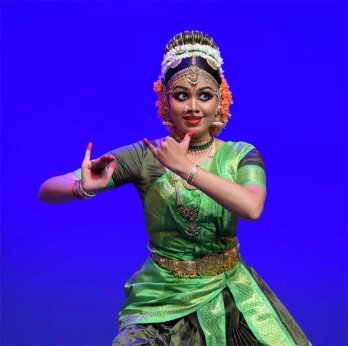 On 4th evening, Sonu S.K, a young Kuchipudi dancer, currently being trained under Dr. Vasanth Kiran and Geetha Padmakumar in Vempati bani, with her vibrant stage presence and quick silver quality of dance received enthusiastic response from audience. Her Kuchipudi was scintillating. Cleverly editing various excerpts of Kuchipudi repertoire, brief excerpt of Bhamakalapam, Bhamane Satyabhamane, executing various pada bhedas, performing Balagopala Krishna pahi maam, and ending with offering salam to the audience she made quick exit, drawing attention that salam daru was once prevalent in Kuchipudi. Vasanth Kiran accompanied her on nattuvangam. She is an accomplished dancer having studied Bharatanatyam, Ottan Thullal, Kathakali and is also a winner of best actress award for TV series. No wonder she has a busy career and is going places. From Delhi, Bharatanatyam exponent Geeta Chandran opened her recital with Chokkanathar Kavutvam, which depicted description of folk and vernacular aspects of Lord Shiva. The various forms of Lord Shiva as Ishana, Dakshinamoorty, Kaal Maari Aadiya Peruman and Chokkanathar who stole the heart of Madurai Mangai, were enacted with arresting postures and finesse. A seasoned artist always pushing the boundaries of classical form and a versatile musician, Geeta chose from Brijbhasha literature, Nandakumarashtakam of Vallabhacharya and choreographed it in a varnam format: Sundara Gopalam, Urvanamalam, Nayana vishalam Dukhaharam, set to Ragamalika weaving in an array of ragas Yaman, Chandrakauns, Kedar, Basant creating a mood that transported the audience to the bowers of Brindavan.The iconic images of lord Krishna, with crown of peacock feather, came alive in his resplendent form. The arresting poses evoked beauteous forms seen in Pichhwai paintings. The mood was soaked in Vaishnava aesthetics. The alternating nritta with exquisite teermanams and joyous abhinaya were captivating with melodious music. The cascades of images, Sudesh, Kunchitakesham, Natavarvesham, Vipinviharam, Chiraharam and so on offering her scope of creating visuals. Stealing clothes of gopis, subjugating serpent Kaliya,Mukhavanditavenu, with enchanting flute casting spell on cows, birds, creepers, waters of Yamuna, Geeta was in great form. There was a complete confluence of text, dance and music with delectable abhinaya. Kabir's Nirguna bhajan: Is ghat andar bag bagicha (within one's body are the gardens and bungalows), extolling the philosophy dealing with body that contains the world, Geeta's choreography saw the musical sounds of conch, veena, flute, mridang, bells, the cosmos within. The song and dance lingered long after its presentation. Concluding with Sankirtan in praise of that divine pair of Radha and Krishna, Vanamali Vasudeva, Jaganmohana, Shashivadana, Sarasijanayana, Radha Ramana, with the refrain of Radha Ramana, Geeta kept the audience in thrall. The accompanying musicians S.Shankar (nattuvangam), Sudha Raghuraman (vocal), G. Raghuraman (flute), M.V. Chandrasekharan (mridangam) gave excellent support. The teamwork was ideal. Costumes by Sandhya Raman, lighting by Shreekanth and compering by Rajiv Chandran complimented the memorable performance. From Mumbai, Mandakini Trivedi presented select numbers, most of which were set to music by K.N. Panicker in Sopanam music. After spending six years in an ashram at Lonavala, she returned to Mohiniattam to ideate philosophical truths and polish these ideas over the years in anonymity and silence. She is fascinated by the link between Natya and Yoga and believes dance as a parallel Yoga. After performing opening number Panchari Katala, a pure dance in raga Samanta Malhari and tala panchari, Mandakini performed her own choreography on theme of river Ganga, titled Ganga Tattvam set to raga Charukesi and tala adi as an ode to river Ganga - the gentle waves of Ganga, devotees offering prayers, various activities seen on banks of rivers and Ganga, whose other name is Mandakini, flowing in her glory. The other episode the dancer wove in was of Parvati's jealousy of Ganga who resides in the locks of lord Shiva. She accuses Shiva for his love for her who is seen in his jata. Shiva denies of another woman saying that what she sees is only water; when Parvati speaks so seeing eyes, Shiva says they are fish frolicking in waters and so on. Parvati sulks and does not accept explanations of her lord. Mandakini chose to present a Gita Govinda ashtapadi Dhira sameere, Yamuna teere, vasati van vanamali set to Suruti and adi tala, composed in Sopana style by K.V.Maniappan. Sakhi tells Radha to leave her pride and go and meet her lord who is awaiting her, looking for her; even when a leaf falls, he looks up if Radha has come, he has prepared a bed of flowers and is awaiting her. Enacting Krishna's role Mandakini appropriately performed abhinaya suiting the male nayaka. The overall impression of the presentation was of restraint. She concluded her programme with Jiva in Ananda Bhairavi and champata tala suggesting union of soul with paramatma. It was accompanied with a Devi sholka in raga Mohanam and khanda chapu tala. It ended with a peaceful note. The musicians accompanying Mandakini included from Mumbai, N.N Sivaprasad (vocal) and K.N.P. Nambisan (maddalam and edakka), and from Trivandrum, Sounderarajan (veena) and Sri Kumar (flute). As ill luck would have it, I got indisposed for next three days and was advised rest. 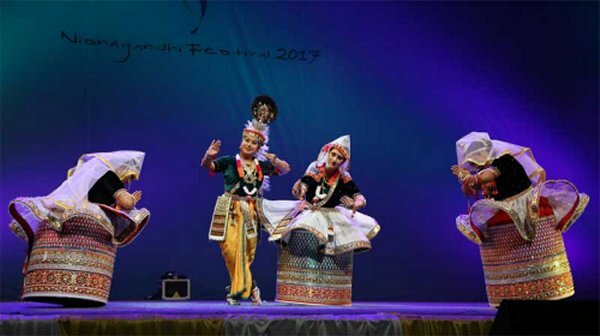 Therefore I missed the performances of the Jhaveri Sisters and their troupe with artists from Imphal, Manipur, the Kuchipudi performance by Vempati's disciple Uma Murali from Chennai and, the dancing Kathak duo Abhimanyu and Vidha Lal from Delhi. I was told by the organizers that their performances were well received as all these artists have high professional reputation. On account of Jallikattu disturbances, Malavika Sarukkai could not come to Trivandrum. 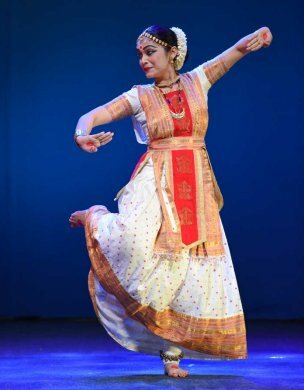 In her place, Guru Girija Chandran's group choreography was presented and a young dancer Aparna Ramchandran presented Mohiniattam. I was told that she is a versatile dancer well versed in Bharatanatyam studying at Sree Sankaracharya University of Sanskrit. She has also studied Kathakali under Kalanilayam Gopinath. It is a welcome policy on part of the festival to give opportunity to young and upcoming dancers. I was able to watch concluding performances of Odissi by Sujata Mohapatra and Contemporary dance by Samudra's Madhu Gopinath and Vakkom Sajeev. 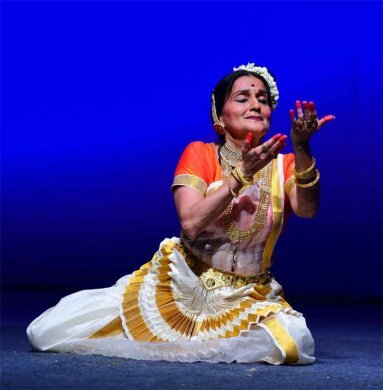 Daughter-in-law and disciple of Guru Kelucharan Mohapatra, Sujata has won commendable reputation as a brilliant Odissi exponent presenting Kelubabu's choreography with fidelity and exquisite grace. To praise her performance is almost like gilding a lily. Each time one watches different choreographies of Guruji, they appear refreshingly fresh and evergreen. The music by Bhubaneswar Mishra and Kelubabu's choreographic works are gems and having watched them for more than forty years, one has relished them. There was expectancy in the air. And Sujata performed with elan and complete involvement. To the choreography of Ratikant Mohapatra, Sujata opened her recital in praise of Lord Vishnu reclining on Shesha naga, with lotus from his nabhi on which sits Lord Brahma. He is the protector of the universe and all saints worship him, an iconic representation with appropriate lighting by that ace lights designer Jaydev. There seems to be an aura about such devotional presentation. Hamsadhwani pallavi saw Sujata in her element, performing in perfect sync with the melodious solfa syllables, the body aligning in vivacious curves and to mnemonics recital along with pallavi. The joyous abandon marked her execution, displaying various basis stances, sculpturesque poses and resolutions of the movements. Taka zenu taka zenu tazam ta zam and tari zam - the melodious notes filled up the auditorium like subtle flagrance. The transition from one phrase to another was smooth and visually pleasant. But it was her enactment based upon Odiya Ramayana, excerpt Jatayu Moksha choreographed by Kelubabu that her intense abhinaya had the audience riveted. The pleasurable time Rama and Sita spent in Panchavati, the appearance of Maricha as golden deer, Sita's attempt to capture the deer and the leaps deer takes, got one involved in watching the unfolding of the story which has a forbidding doom. Rama running after deer, Sita begging Lakshmana to go to rescue Rama, he drawing three Lakshmana rekhas, Ravana's appearing in guise as a mendicant, kidnapping Sita as she crossed the rekhas and feeling helpless, throwing her ornaments from the sky and final encounter with Jatayu who valiantly fought with Ravana who slashed his wings wounding him and moving on carrying Sita to Lanka. Rama seeing Jatayu and learning about Ravana carrying her away is distraught but brings water and performs last rites for Jatayu's departure to heaven. He begs and asks birds, creepers where his beloved Sita has gone. Sujata's ability to get under the skin of each character invests her rendering of this episode with matchless choreography of Kelubabu and she invariably receives thunderous applause from the audience, as so intense is the depiction of the story, the appeal of which is timeless. Sujata received musical support from her trusted musicians Ramesh Chandra Das (violin), Ekalavya Muduli (pakhavaj), Soumya Ranjan Joshi (flute), Binod Bihari Panda and Manoj Mati (vocals). This year the organizers have added the category of Contemporary dance. Two dynamic male performers Madhu Gopinath and Vakkom Sajeev of Samudra Arts and their company with female dancers and boys presented their choreography of Cosmic Dance of Shiva. They unleashed superb energy with their trained bodies in Kalaripayattu, mallakhamb and Bharatanatyam in seamless manner. The split with which female dancers fell on the floor or with agility of spring, executed breathtaking acrobatic poses, yoga, lifting legs in Urdhva Tandava et al were performed with such dexterity that the onlookers were astounded. The recitation of sacred mantras, the unusual way the hastas were used to depict Sivalinga, various iconic and imaginative features, all mesmerized the audience. The movements drawn from yoga, Bharatanatyam and Kalaripayattu blended in an exciting manner, revealing their capacity to absorb them as a body language and communicate the sheer power of the universal Lord. The pulsating throbbing music in consonance composed by Rameshnarayan, with the choreographic patterns was hypnotic. The imaginative lighting by Sreekanth to enhance the mood, creation, preservation and destruction, found felicitous expression in their presentation. 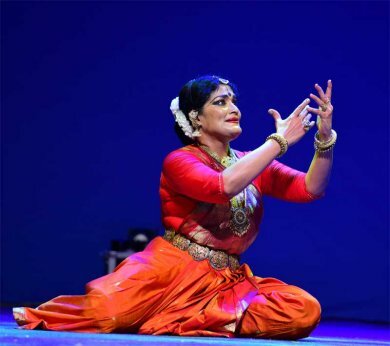 Madhu Gopinath and Vakkom Sajeev were the two principal male dancers, who had conceived, designed, choreographed and directed the production; the female dancers were Sajeev's wife Deepa Sajeev, Suparnika, Bhavya Vijayan, Nishamole and the other male dancers were Sathyachitra, Aneessoman and Rahul. Their team work was praiseworthy. It was heartening to see young dancers in their company performing so well. After a fifty minute continuous performance they concluded with excellent postures of Lord Shiva. In the end thanking the audience they invited them to perform following their gestures for Vande Mataram, receiving instant support. They have earned international repute but this was for the first time that the prestigious Nishagandhi Dance Festval had invited them to perform for which they acknowledged their gratitude. The audience loved them. The festival was a runaway success. The arrangements were faultless, the backdrop unobtrusive minus hoardings, aesthetic and compering pleasant. The program booklet was well designed. However, one would recommend that there should be details given about the items to be presented with details of raga and tala and names of musicians. Principal Secretary of Tourism, Dr. V. Venu, IAS, Deputy Director Anil Kumar, tourist information officer Bindu Moni and a team of ever ready and smiling volunteers deserve kudos for organizing such a festival on such a mega scale. The audiences deserve compliments for the disciplined way in which they enjoyed the performances. The participating dancers thanked Kerala Tourism Department for their hospitality and taking care of them in an ideal manner.